^ 1.0 1.1 1.2 Bishop, Chris, Guns in Combat, Chartwell Books, 1998, ISBN 0-7858-0844-2 . ^ 2.0 2.1 Raeburn, Michael. We are everywhere: Narratives from Rhodesian guerillas. : 1–209. ^ 4.0 4.1 7.62mm Submachine Gun PPSh41. [2010-03-21]. ^ （俄文） Наставление по стрелковому делу. Пистолет-пулемёт обр. 1941 г. [NSD-41. PPSh-41]. Moscow: Voenizdat. 1941. ^ Edwards, Paul M. The Korean War. Westport, CT: Greenwood Press. 2006: 77. ISBN 0-313-33248-7. ^ Military Factory, PPSh-41 Submachine Gun. [2012-02-16]. ^ Bishop, Chris. The Encyclopedia of Weapons of World War II Illustrated. Sterling Publishing Company, Inc. 2002: 261. ISBN 1-58663-762-2. ^ Rodric Braithwaite, Moscow 1941: A City and its People at War, London: Profile Books, 2006, p. 236. ^ 13.0 13.1 13.2 13.3 13.4 Shpagin PPSh-41 submachine gun (USSR). [2010-03-21]. （原始内容存档于2010-03-08）. ^ Mosier, The Blitzkrieg Myth, p.86. ^ 15.0 15.1 9 mm Conversion of the PPSh-41 互联网档案馆的存檔，存档日期2010-05-07. ^ 16.0 16.1 WW2 Warbirds: the Tupolev Tu-2. [2010-11-16]. （原始内容存档于2003-05-19）. ^ 17.0 17.1 17.2 Halberstam, David. The Coldest Winter. Hyperion Press. 2007: 447. ISBN 978-1-4013-0052-4. ^ Leroy Thompson. 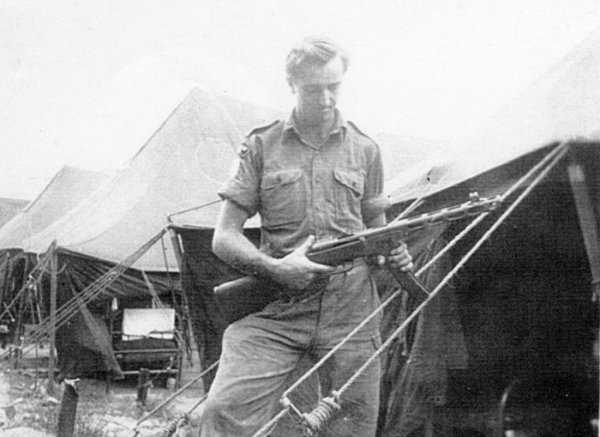 The M1 Carbine. Osprey Publishing. 2011: 56. ISBN 978-1-84908-619-6. ^ 22.0 22.1 22.2 22.3 Jones, Richard D.; Ness, Leland S. (编). Jane's Infantry Weapons 2009/2010 35th. Coulsdon: Jane's Information Group. January 27, 2009. ISBN 978-0-7106-2869-5. ^ 25.0 25.1 Miller, David (2001). The Illustrated Directory of 20th Century Guns. Salamander Books Ltd. ISBN 1-84065-245-4. ^ Machine Pistols, Captured and Bought. [2012-01-28]. ^ 9 mm version of PPD-40 and PPSh-41. [2012-01-28]. （原始内容存档于2012-02-09）. ^ Rottman, Gordon. The Berlin Wall and the Intra-German Border 1961-89. Oxford: Osprey Publishing. 2008: 44. ISBN 978 184603 1939. ^ 31.0 31.1 Maj. Gen. J. I. Hardback. Owen. 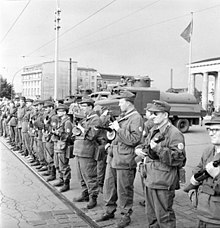 Warsaw Pact infantry and its weapons: Manportable weapons and equipment in service with the regular and reserve forces of the Soviet Union, Bulgaria, Poland, Rumania, and of Yugoslavia. 1976. ^ Thomas Ohlson. Arms Transfer Limitations and Third World Security. Oxford University Press. : 103. ISBN 0-19-829124-8. ^ 33.0 33.1 33.2 US Department of Defense, North Korea Country Handbook 1997, Appendix A: Equipment Recognition, PPSH 1943 SUBMACHINEGUN (TYPE-50 CHINA/MODEL-49 DPRK), p. A-79. ^ Steven J. Zaloga, Richard Hook. The Polish Army 1939-1945. Osprey Publishing. 1982: 39. ISBN 0-85045-417-4. ^ By Philip Peterson. Standard Catalog of Military Firearms: The Collector's Price and Reference Guide. 2011: 479. ISBN 1-4402-1451-4. ^ Rob Krott. Save the Last Bullet for Yourself: A Soldier of Fortune in the Balkans and Somalia. : 175. ISBN 1-932033-95-5. 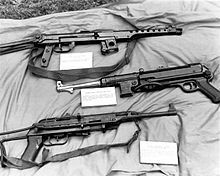 ^ PPSh41 Sub Machine Gun. [2009-01-17]. （原始内容存档于2008-07-25）. ^ 38.0 38.1 Modern Firearms' K-50M Submachine Gun. [2009-01-17]. This page is based on the Wikipedia article PPSh-41冲锋枪; it is used under the Creative Commons Attribution-ShareAlike 3.0 Unported License (CC-BY-SA). You may redistribute it, verbatim or modified, providing that you comply with the terms of the CC-BY-SA.